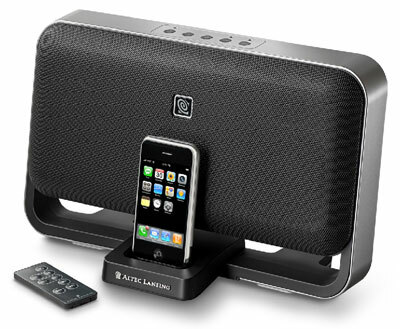 Altec Lansing launched the first Apple Endorsed iPhone Docking Station. Altec Lansing, a division of Plantronics, Inc. announced the release of its newest iPod, iPod Touch and iPhone docking station. The Altec Lansing T612 is the first docking station endorsed by Apple to pair with the soon to be released iPhone as well as Apple's other portable music devices including the iPod, Nano and iPod Touch. Made to complement the iPod Touch and iPhone's striking design, the T612 extends your iPod's high-end audio capabilities with beautifully transparent music reproduction. The T612 is specifically designed to be shielded from GSM phone interference and is protected from the annoying intermittent noises and distortion common when a mobile device is used near a speaker system. In addition the T612 enables the iPhone to be used without switching to 'flight mode' so you'll never miss a call while playing music. When a call comes in the T612 gives the call priority by interrupting the music and recommencing at the conclusion of the call. "Altec Lansing engineer all its products using exceptionally high quality standards which is why the T612 has been endorsed by Apple for use with the soon to be released iPhone" said Chris Brown, National Retail Sales Manager, Plantronics Australia and New Zealand. "Some people say that seeing is believing but when you hear the quality of the sound from the T612 you'll understand why we think that hearing is believing." The T612 has four specially engineered speakers which reproduce music across the full audio spectrum. The docking station features XdB bass-enhancement technology to create great sounding bass without the need for a subwoofer. **The T612 will also recharge your iPod, and gives you control at your fingertips with the included wireless remote so that you can control track selection, volume and treble/base. The chic design will also look good in any room in your home either on a table or mounted to the wall. The T612 also gives you the option to connect your MP3 or CD player at the same time as your iPod. The Altec Lansing T612 docking station has a RRP of $399.00 and will be distributed by Roadhound Electronics, Anyware Computer Accessories and Amber Technology.